My husband has a few signature dishes, and this is one of them. 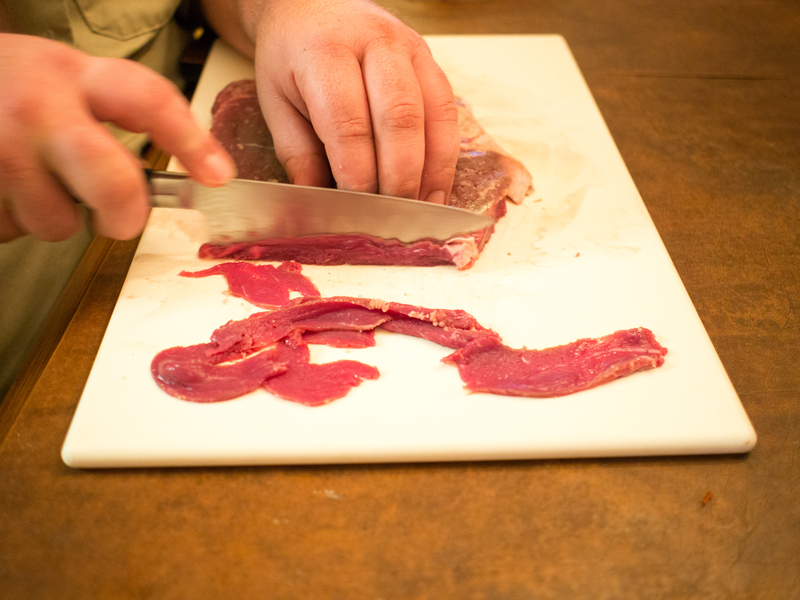 When I first met him, he was all about meatloaf, meat and rice, and Italian Sausage dishes. Then, one day, he tried Pho at a local restaurant and was hooked. He discovered how to make it and will make it for me if I’m feeling under the weather. Isn’t he amazing? I love Asian foods. However, I’m more than a little intimidated by the cooking styles, equipment, and ingredients. The closest I came to making any Asian food at home growing up was busting open a can of La Choy brand Chinese food, heating it up and serving with rice. 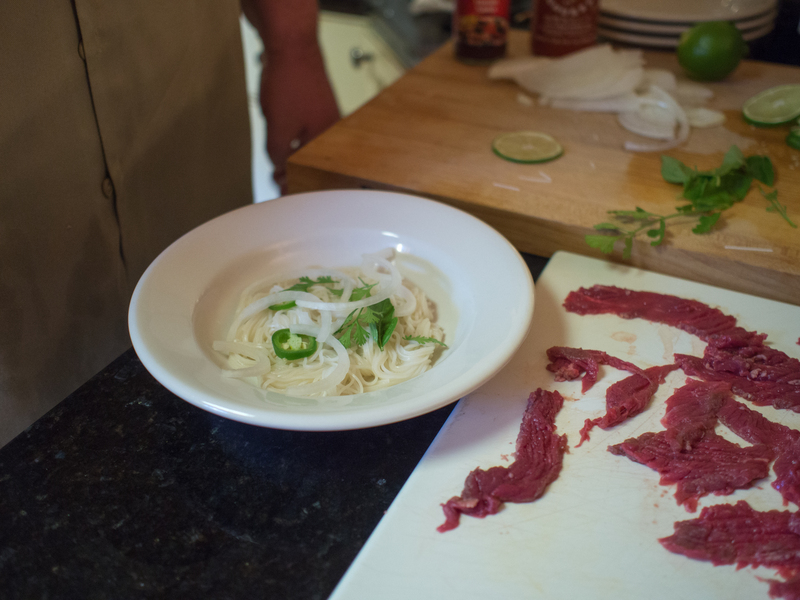 But the hubs researched Pho and it seemed very doable with no special equipment or ingredients. I hate to say it’s pretty easy, because I love the mystique of exotic foods, but it’s pretty easy. We’ve been making it at home ever since. Let me just say, your home will smell amazing. Anytime you have broth cooking all day is a day to sit and enjoy the aroma. It’s intoxicating. As an overview, you are mostly cooking a beef stock and some noodles. 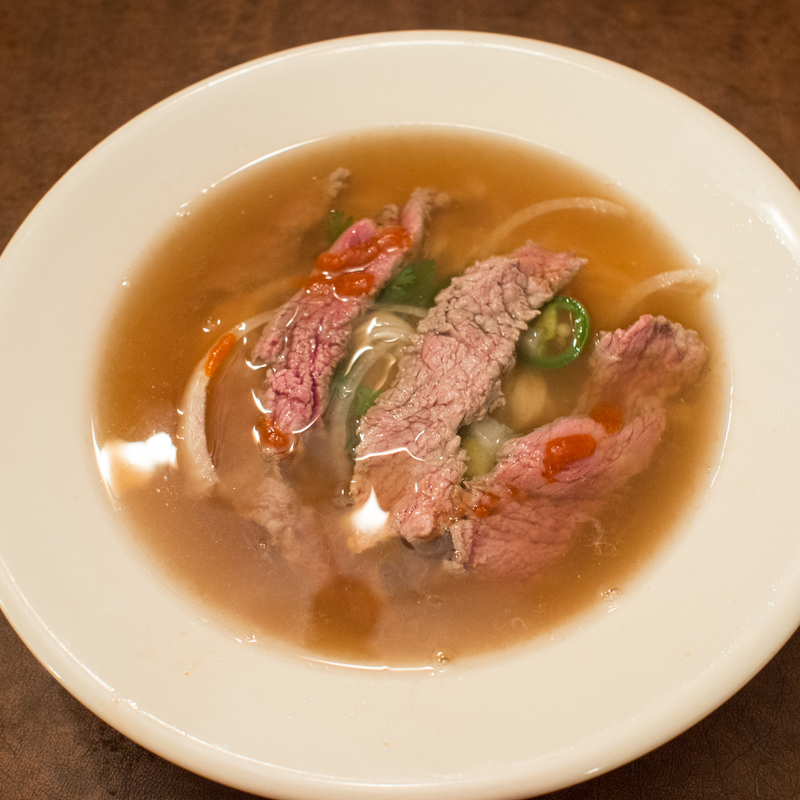 You are letting the stock quick cook the beef in Pho. It’s important that your bowl not really be cold when you add the stock, or your meat may not cook all the way through. In other words, the bowl should be hot, the noodles hot, your mix-ins and the broth immediately added. The beef should be submerged into hot broth to cook. One other tip, don’t think you can, say, substitute an eye of round and cut it really thin and hope to have a decent pho. What you will have is sore jaw muscles from all the chewing! Put the bones, celery, onions, garlic and ginger onto a large sheet pan and roast brown or slightly charred, about 30-40 minutes. Smaller pieces may need to be removed earlier to prevent burning. Put roasted bones and vegetables into a large stockpot and add enough water to cover the bones by 4 inches (about 2 gallons). Add the fish sauce and spices besides salt into the stockpot. Bring to a full boil and then lower the heat to a rapid simmer. Add 1 tablespoon of salt at this point. Skim any scum that rises to the surface. Let the broth simmer, uncovered, skimming occasionally. 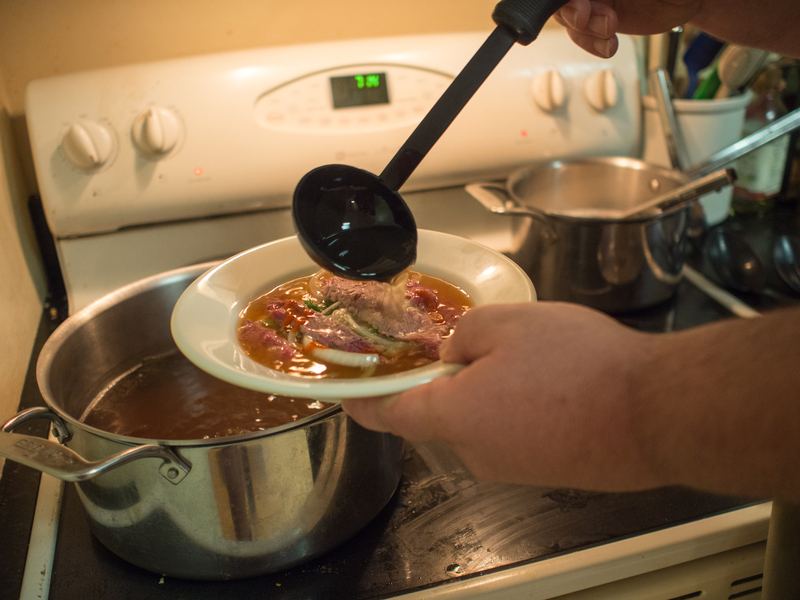 After 4 hours, using a slotted spoon and small strainer, remove items in the broth, setting aside the oxtails. Let the broth continue to simmer. Remove any meat from the bone and return bones to the stock pot. Continue simmering, uncovered, until the broth is rich and flavorful, an additional 1 hour. Taste the broth and add more salt or fish sauce as needed. As the broth is simmering, soak the rice noodles in cold water for at least 20 minutes. 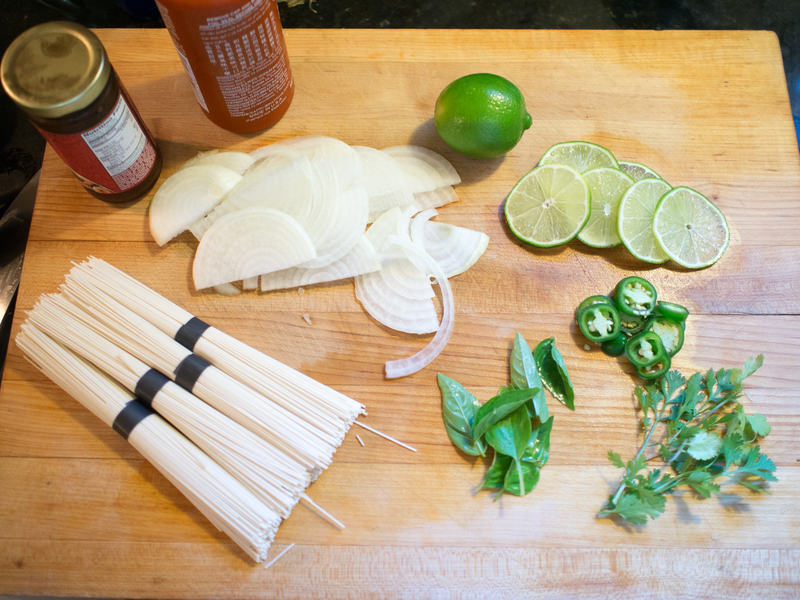 Arrange the sliced scallions, cilantro, basil, lime wedges, and jalapeño peppers on a platter in separate piles. 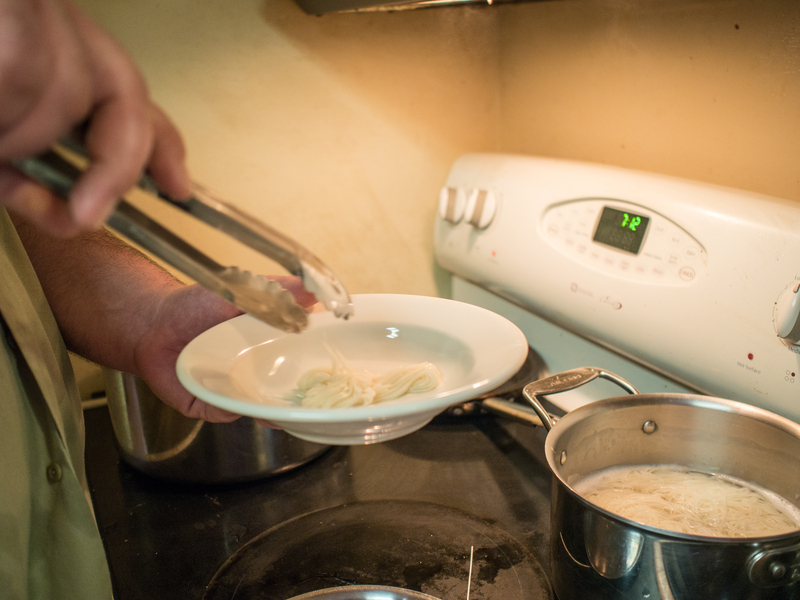 Bring a large pot of water to a boil and add the drained rice noodles. Give the noodles a quick stir and cook until tender but firm, about 1 minute. Don’t overcook the rice noodles, or you risk “gummy” noodles. Drain the noodles. Warm 6 large bowls by rinsing them with hot water and divide the noodles among the bowls. Just before serving, return the broth to a full boil. 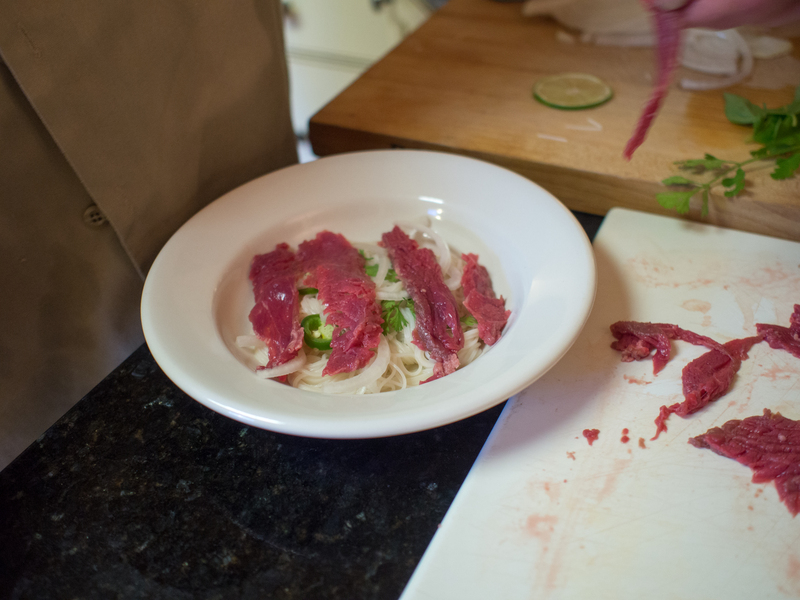 Arrange the slices of raw filet and pieces of cooked oxtail meat over the noodles in each bowl. Carefully ladle the boiling broth over all; the raw beef should be submerged in the broth. Serve immediately, along with the platters of garnish. This entry was posted in Beef, Low(er) Carb, Main Dishes, Soup and tagged Beef, beef stock, Fish sauce, La Choy, Oxtail, Pho, Vietnam, vietnamese cooking on July 6, 2013 by dawn of food.